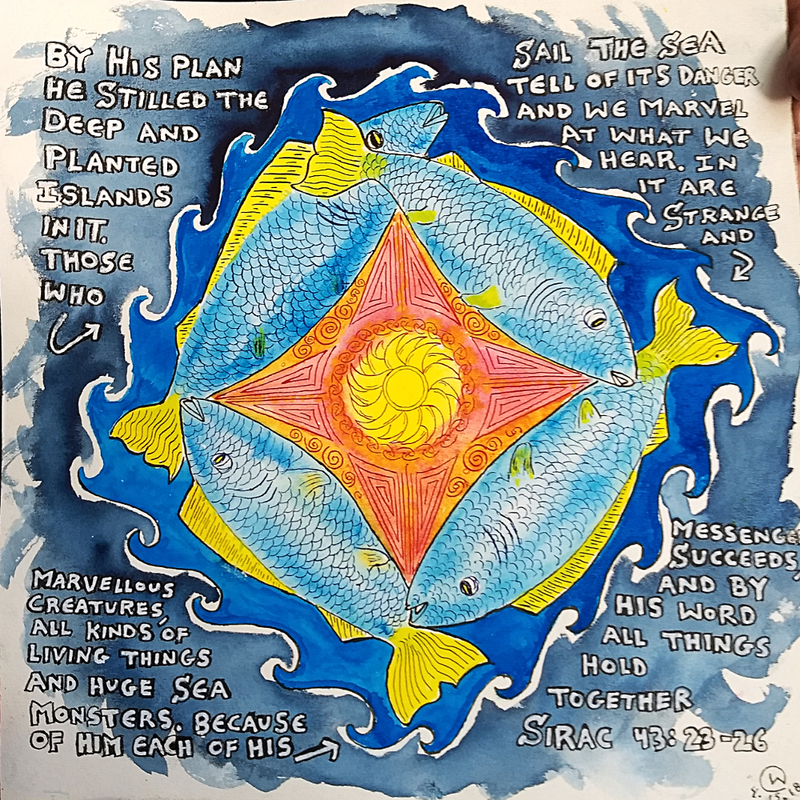 4.20.18 12 x 12 water color: Four Fish 12"x12" on 140 lb water color paper- simular design the to the one below- slightly longer quote from Sirac. I love this quote- "through Him all things hold together". Reminds me of John 1:3-4 All things came into being through him, and without him not one thing came into being. What has come into being 4 in him was life,[a] and the life was the light of all people. 5 The light shines in the darkness, and the darkness did not overcome it. 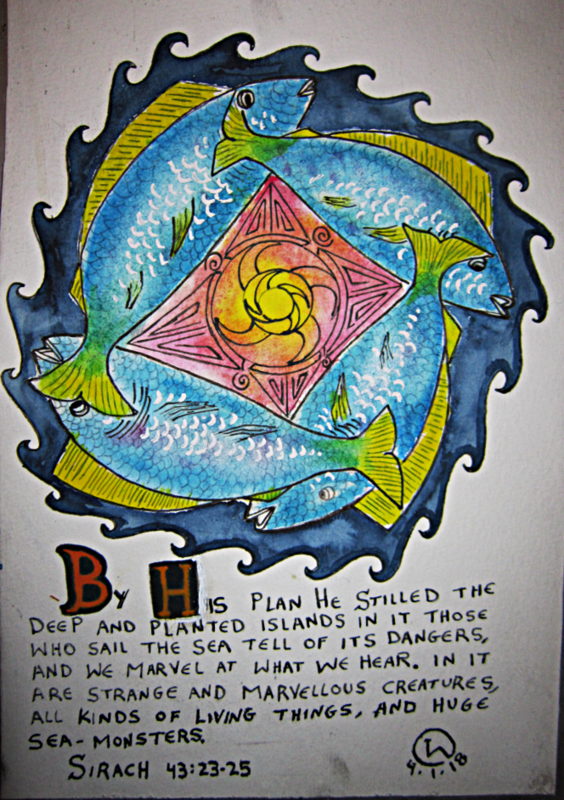 4.4.18 Four Fish design with text from Sirach It has been obviously quite awhile since I've made an entry. This is a design for a larger piece I'm planning- a 12 x 12. 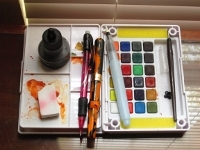 I've been using Dr. Ph Martin's Hydrus watercolors on 140 lb cold pressed paper. 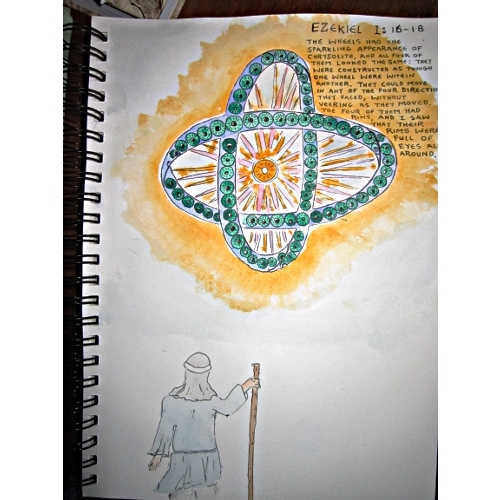 03/16/14 detail of an illustrated letter- Ezekiel and the Wheel I have quite a bit to say about this one- but to start it might be helpful to think about the movie the Matrix for a minute and in particular about the "red pill". From the wikipedia entry: The red pill and its opposite, the blue pill, are pop culture symbols representing the choice between embracing the sometimes painful truth of reality (red pill) and the blissful ignorance of illusion (blue pill). 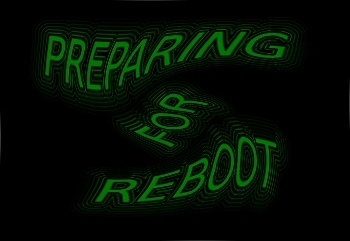 The terms, popularized in science fiction culture, derive from the 1999 film The Matrix. In the movie, the main character Neo is offered the choice between a red pill and a blue pill. The blue pill would allow him to remain in the fabricated reality of the Matrix, therefore living the "illusion of ignorance", while the red pill would lead to his escape from the Matrix and into the real world, therefore living the "truth of reality". 03/16/14 detail of an illustrated letter Well, its been quite awhile since my last entry- I'm reminded of that excellent story Dark They Were and Golden Eyed by Ray Bradbury. 1st there were no Martians, then there were Martians- What? You have no idea what I'm talking about? hummmmph! Well, you should just take a minute now and read the story. Anyway, this is a recent drawing done on 110 lb mixed media paper with watercolor and a fountain pen with a "stub" nib filled with Aurora black ink. It was for an illustrated letter- somehow I didn't feel like putting it on FB- which would have "reformatted" it, read my description, and then targeted me with appropriate, or inappropriate adds. so here it is tonight, ad free, spy ware free. 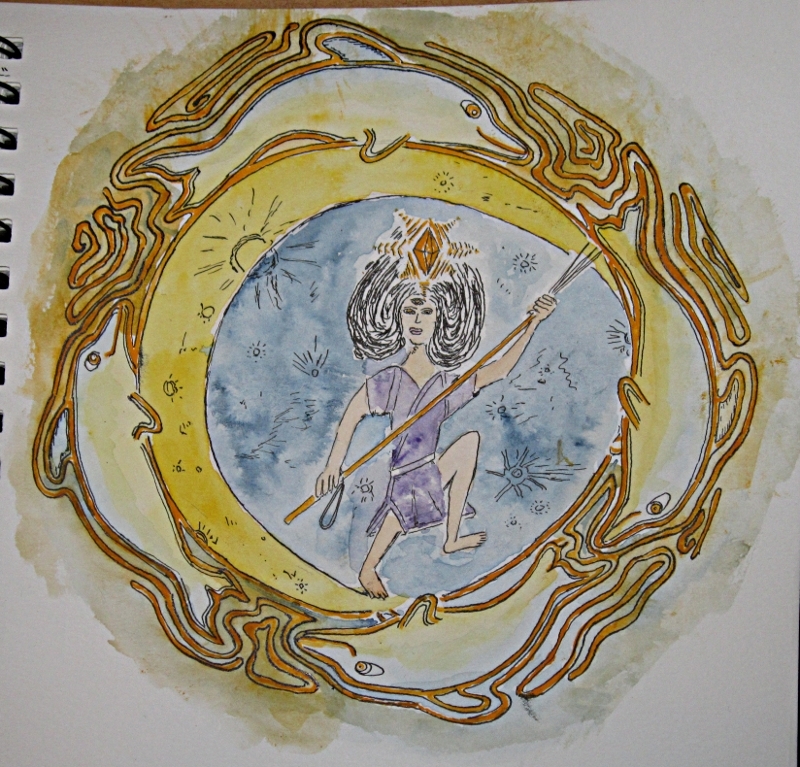 09/15/13 Three Eyed Goddess with Dolphins and Pole Spear Tonights entry is about imperfection and our willingness, or lack thereof, to proceed knowing the imperfections. This water color and India ink drawing has some imperfections- with me being the judge- a few things went awry- didn't turn out exactly as I had planned or hoped- parts got mudded, lines became jagged or crossed, proportions were at best approximate... yet, here it is. The old saying is: to error is human. This is a drawing, or painting, or whatever it is, done by a human, by hand; and in that lies its uniqueness and whatever charm it has. If I held the notion, "I'll not put pen or brush to paper unless I'm assured the result will be perfect." There would be no Three Eyed Goddess with Dolphins and Pole Spear to see tonight- Like most things in life, art is often a W.I.P. (work in progress). 09/14/13 Its another hot day here in TX. Well... of course Texas is hot in the summer- given the state's somewhat unusual geographical location. 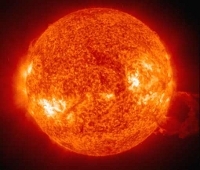 Most locations on Earth are approximately 93 million miles away from the sun. Not so with Texas- its... oh... on most days... about three miles away- during the summer that is. Why in the winter its been know to be as far away as six or seven miles- one especially "cold winter" the sun was nine miles away. Some say that TX is "hotter than the surface of the Sun" but this just an absurd exaggeration. Don't ask me why, but once, just to see what it was like, I walked from our house to the surface of the sun- and I tell you it was definitely hotter there. 09/07/13 So I buy a coconut for a dollar- whew... the tropics do have thier perks... and I come home and drain the water out with a couple of holes- then I smack it with a hammer- don't be shocked. Really, this is what happens to coconuts- just part of way things work for coconuts. 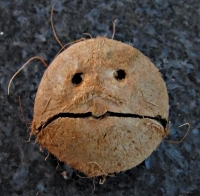 I look down and see that my coconut appears unhappy. Ah well- it was tasty. 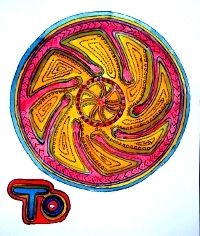 09/06/13 A bit of hippie art done while listening to some old Ravi Shankar- destined for an illustrated letter. Done with water colors using a "brush pen" and a "crows quill" dipping pen on 98 lb. mixed media paper. I like the sense of movement in it- it reminds me of the "wheel of the dharma" which of course is turned by the "wheel turning lords". 08/29/13 A picture of my basic art stuff- lately it has been moved a lot and used little- though that will likely change in the coming weeks. It looks like the "covered Porch" may become a favorite place for me do a bit of writing and illustration in the mornings or on rainy afternoons- the light is pretty good- the sense of "space" feels right. 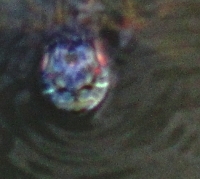 08/28/13 This is a picture of a turtle's head taken at a nearby pond. How alien and primitive the turtles look- with algae growing on their shells and their heads prowling just above the warm silty waters. 08/22/13 I'm easily amazed at how easy it it to get out and have fun here. Often times I "settle" for the easiest option- which is swimming. It is a 3/4 island- water just about everywhere you look. The pool is very fine- good balance of chemicals, just the right temp, and so far always a lane to myself. Swimming has become the default option for the question, "what is today's recreation? 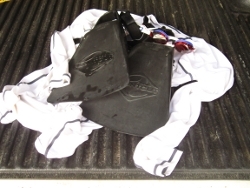 This a picture of my basic swim stuff- not including the pair of red board shorts I was wearing. 08/13/13 One of the things about living in a new place or new house is the little surprises that manifest themselves. 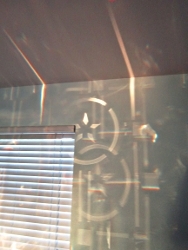 This pattern on the wall was caused by a stained glass design in the door being reflected by the old mirror in the hutch in the entryway. 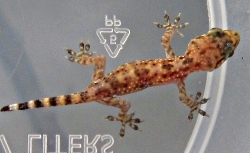 08/09/13 Found a little "common house gecko". Such a small creature- very delicate. Must have some skills though as he, or she, survived a couple days in the house with a very determined and patient cat who was on the "hunt". 08/05/13 Odd perhaps for one of the 1st entries on the 3rd Coast but these bugs (cicada) are huge, and loud, and dominate the night. I"m not really sure if I went sufficiently "with the flow" or not. Suffice it say that we are here, sound in body and mind, with all our stuff intact. 07/24/13 Its a bit like riding a wave- you come out much better if you go with the flow. 07/17/13 I unearthed a dragon I drew in 1998. Two quotes came to mind: one by Dogen: "If you become thus utterly free. You will be as the water wherein the dragon dwells. Or as the mountain whereon the tiger roams." and one by Tolkien told to me this afternoon by my son. It is from the Hobbit where Bilbo Baggins has a "conversation" with Smog, "My armour is like tenfold shields, my teeth are swords, my claws spears, the shock of my tail is a thunderbolt, my wings a hurricane, and my breath death!" 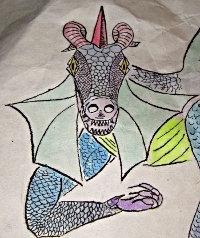 So what kind of dragon was this when I drew it in 1998? What kind of a dragon is it today? 07/16/13 I realize today that I had no clear idea of the rising tide of chaos. The waters of dislocation reached new heights today and appear to to be on the increase. 07/15/13: I'm fairly certain that as a household we have reached peak pre-move chaos. Loaded boxes are beginning to manifest themselves in abundance. 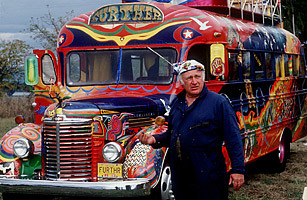 Let's hope that they all find room on the truck because come the morning of the 23rd, as Ken Kesey might say, you're either on the truck or off the truck. 07/14/12: Still thinking on the picture below- it took me off into some familiar and pleasant wanderings along the lines of the I Pencil and Indra's Net and then it reminded me of a children's book once on a time by A A milne and a character called Wigs who was always reading books when she should have been dusting them. 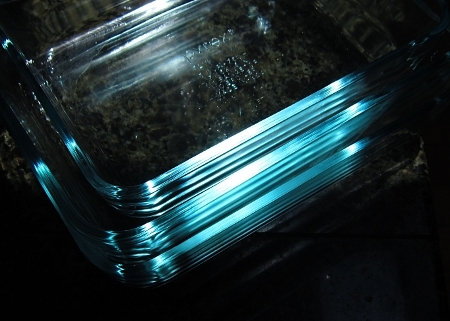 So there I was, musing on the Pyrex when I should have been packing it. 07/12/13: interesting how even in the midsts of chaos there is structure and beauty. Like most things in life, there is a story behind the picture.